“As companies are choosing to grow and expand in our state, we are continuing to see Florida experience a positive economic recovery. Floridians have more and more opportunities to get back to work, and last month, 9,000 Floridians were able to get a job and provide for their families. “Our strategy for Florida is working. We are lowering taxes and eliminating burdensome business regulations so that private-sector jobs can grow, and we are also making sure we have a well-educated workforce. As a result, Florida’s economy is headed in the right direction, and annual sales of single-family homes are 6.6 percent ahead of last year. Median prices have consistently trended upward since last November and are currently up 16.1 percent, signaling good news for Floridians looking to sell their homes. For the 12 months ending this June, residential building permits are up 25 percent over the previous year, and Florida is now anticipating more people moving into our state than in recent years, based on last week’s Demographic Estimating Conference. Consumer spending in the state is strong, as indicated by a 4.7-percent increase in sales tax collections for the 12-month period ending this June. This morning, Governor Scott visited the One-Stop Career Center in Zephyrhills, overseen by the Pasco Hernando Workforce Board, to thank and recognize the staff for efforts that have resulted in the region consistently ranking first or second out of 24 regional workforce boards statewide for reported job placements every month since January. While there, Governor Scott met Adam Hartz, a Pasco County resident who was hired last month by Manufacturers Distributor Inc. (MDI), thanks to employment services he received from One-Stop staff. A veteran of the United States Marine Corps, Hartz is progressing very well in his new position, according to his employer. He is also gaining valuable experience and knowledge in a new career field. There are nearly 100 One-Stop Career Centers located throughout the state. Employers and job seekers are encouraged to contact their local One-Stop for assistance with hiring needs, job placement and training. 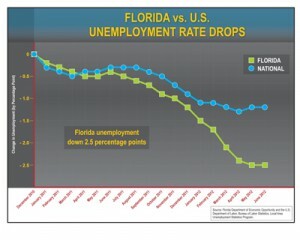 For the location of the nearest One-Stop, please visit this link and click on the corresponding region: http://www.floridajobs.org/onestop/onestopdir/index.html.